St Rita was born into a noble and pious family at Margherita, Italy. In her youth, she wanted to join a religious order but was dissuaded and instead, entered into an arranged marriage at the age of 12yrs – not unusual at that time. St Rita had two sons, the first child when she was still 12yrs old. Her rich husband was very abusive to her and he had many enemies. St Rita endured his insults, physical abuse and infidelities and, slowly over time he began to change. However, a historical family feud persisted and although her husband believed peace had been finally agreed, he was tricked and stabbed to death. St Rita feared that her sons, now in their mid-teens, would take revenge. Although that may have been their early banter, it was not their intention. However, fate dealt them an unfortunate hand when, about a year later, they both died from dysentery. 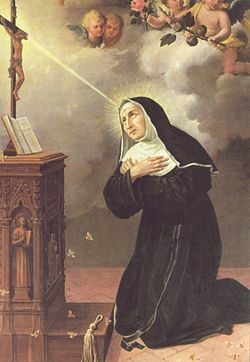 After great persistence and a public reconciliation with her husband’s murderers, St Rita was finally allowed to enter the St Augustinian Order, aged 36. In the convent, she lived a life of penance and prayer and remained there until her death. She received partial stigmata when praying in front of a crucifix; suddenly a wound appeared on her forehead as if from a thorn of Jesus’ ‘crown of thorns’. She was then about 60yrs and the wound remained with her for the rest of her life. St Rita is the Patron Saint of abused and heartbroken wives and, along with St Jude, lost causes. St Rita’s incorrupt body is interred in the Basilica of Cascia. Her Feast Day is the 22nd May, the anniversary of the date of her death. Pray for us that we will persevere in life, despite the trials.